StayLinked’s SmartTE is at the forefront of the current migration from Windows to Android operating systems in the supply chain. SmartTE easily transforms traditional Terminal Emulation screens into graphical, touch-based screens in a fraction of the time of competitive products. This new relationship will allow Bluebird customers to seamlessly migrate to new devices and operating systems in a matter of hours, not weeks or months as with other solutions. Bluebird handhelds and tablets run sophisticated mobile apps and data collection software on a powerful platform that is extremely familiar and easy to use. Bluebird devices, such as the Bluebird EF400 and EF500, are sealed against water and dust and can streamline a variety of tasks: Scan barcodes in a warehouse, look up stock on a sales floor, or take them on the road in a delivery truck. 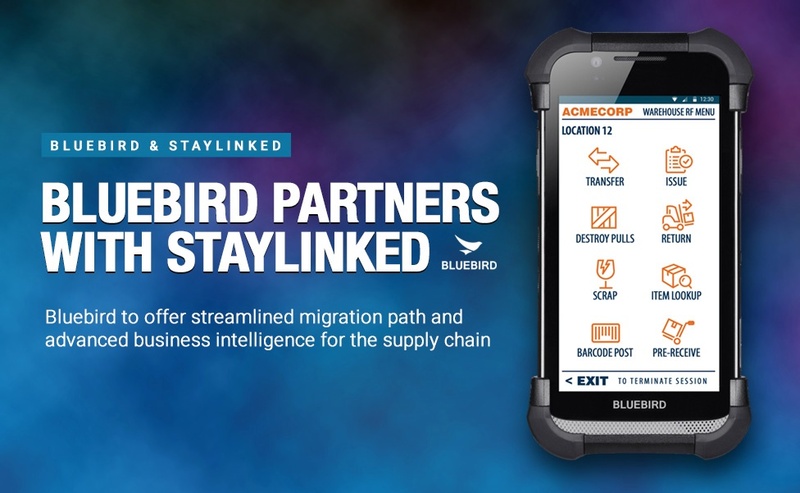 And with StayLinked Terminal Emulation, Bluebird can now offer customers modernized Terminal Emulation applications using StayLinked SmartTE and they can gain visibility into their production environment with the integrated business intelligence and analytics of StayLinked iQ. "Because of StayLinked’s reputation for session persistence and unparalleled support, we are excited to include StayLinked’s Terminal Emulation solution on our ruggedized devices." said Bluebird’s Calvin Cho, Market Development Manager, Global Business Division. "We are pleased to offer StayLinked pre-loaded on Bluebird Android devices. We are also eager to offer our customers the integrated business analytics that comes with StayLinked iQ. StayLinked will be a crucial part of our Terminal Emulation strategy moving forward." The unique architecture of StayLinked Terminal Emulation connects mobile devices to host-based applications such as Warehouse Management Systems (WMS) and Enterprise Resource Planning (ERP) systems in a very reliable, secure, and high-performance manner. With StayLinked SmartTE and Bluebird, you can apply touchscreen capabilities to your warehouse applications right out of the box. Those who do have a combination of hardware types from different manufacturers know how hard it can be to choose a software solution that can work seamlessly across these devices. At StayLinked, we’ve worked hard to make sure that your legacy Terminal Emulation apps can take advantage of what Bluebird devices have to offer, even without a hardware keyboard. That means that no matter what new hardware you decide to use, StayLinked SmartTE just works.